From Michigan to Estero, four former Olympic skaters bring nearly 20 high level ice dancers to Hertz Arena to train permanently and gear up for their annual performance this Sunday. 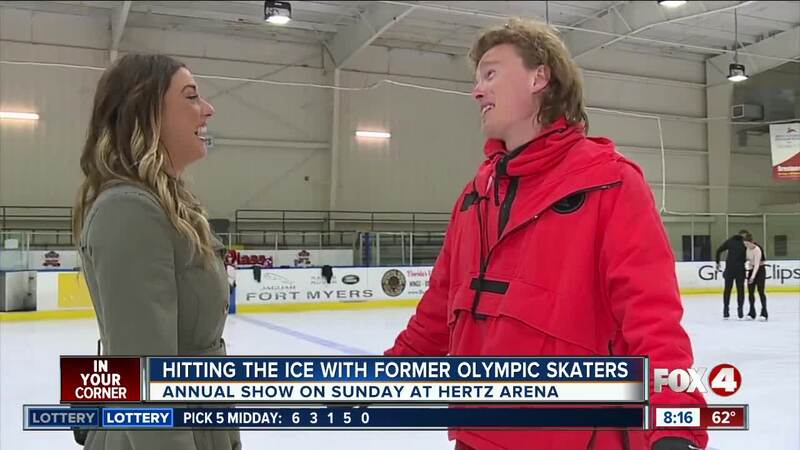 ESTERO, Fla. — From Michigan to Estero, four former Olympic skaters bring nearly 20 high level ice dancers to Hertz Arena to train permanently and gear up for their annual performance this Sunday. Marina Zoueva is a World and Olympic coach, specializing in Ice Dance, Singles and Pairs. Her professional accomplishments include an Olympic Pairs gold medalist in 1988 and 1994 , a 2010 Olympic Ice Dance Gold medalist, a 2010 Olympic Ice Dance silver medalist, a 2014 Olympic Ice Dance silver medalists, a 2018 Olympic Ice Dance Bronze medalist, a 5 Time World Champion in Pairs, a 2 Time World Champion in Ice Dance, U.S. coach and choreographer of the year. You can book a session with her by emailing mzoueva@yahoo.com. Once an Olympic Competitor, Alper Ucar is now an ice dance coach. He coached in Europe for over eight years and was appointed by the International Skating Union as an appointed Skater and Ice Dance Technical Committee member. He is an Ice Dance Athlete commissioner with active duty until 2019 World Championships. He is also a National Turkish Technical Specialist in Ice Dance and expertise in Partnering Ice Dance Pattern Dance. You can book a session with him by emailing alperucar@gmail.com. Ilya Tkachenko specializes in young skaters, competitive skaters and hockey players. He was on the Russian National Team for 10 years, Israeli National Champion for 2 years, 3 time silver medalist at Russian Junior Championships, Bronze medalist at Russian Junior Championship, Bronze medalist at Junior World Championships, Gold medalist at Junior Grand Prix Final, 2 time bronze medalist at Russian National Championships, 3 time bronze medalist at Senior Grand Prix series, Silver medalist at Senior Grand Prix, Bronze medalist at European championships (short dance) and Ninth place at the World Championships. You can book a session with him by emailing noooodly@gmail.com. Johnny Johns has over 35 years of coaching experience. He is a gold medalist in figures, pairs and ice dance. He was a National Ice Dance Champion in 1973. In both 1974 and 1975, he was the U.S. Pairs Champion. He was also a member of the world team from 1971-1975. You can book a session with him by emailing johnnykjohns@yahoo.com.